So I posted a little teaser about this yesterday and here’s my report. I was going to do an update post that I updated as I went along, but then I hadn’t actually finished a whole book by the time I went to bed and left it to round up today. I wasn’t entirely successful in this. There were more distractors than I’d hoped for and, while I can’t stay up late or do without sleep, I slept more than I usually do! Here goes with the report, and I’ll do brief reviews of the two books I finished. 1.00-2.00 pm – in a course for Run Leaders put on by England Athletics – it would have seemed a little rude to whip out a book. 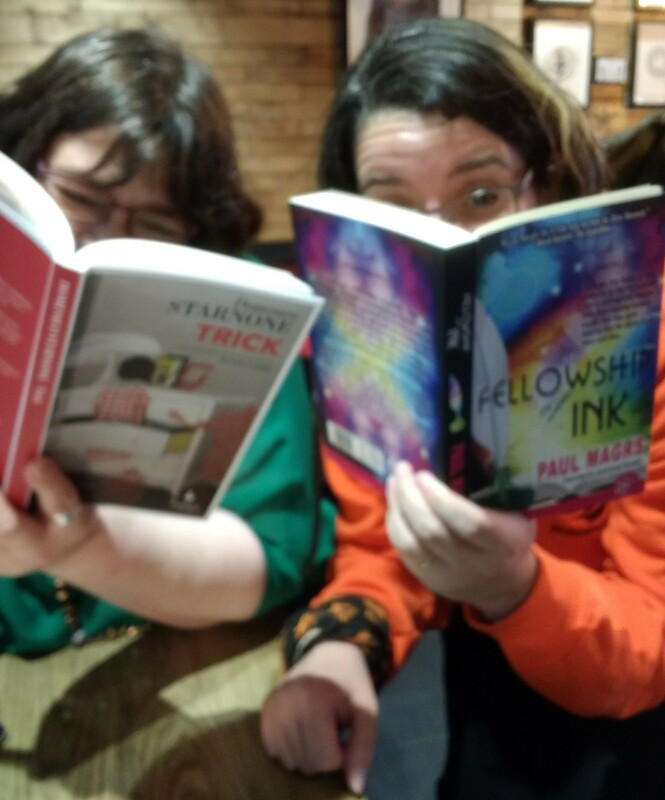 2.00-3.00 – After eating my sandwiches, I managed 6 pages of “Fellowship of Ink” on the bus back into town. 3.00-5.00 – At the BookCrossing meetup. Pictured above are me and Heaven-Ali, a good booky friend of mine who was also doing the challenge (read her report here). Although we did get everyone around the table reading a few pages, I’m not sure I actually got any proper reading done. Then got the bus home with lovely friends and wanted to talk to them rather than read! 6.00-7.00 – I had to do some work which took out an hour and a bit of reading time. 9.00-10.00 – Husband phoned for a chat and so 6 pages read. And then I fell asleep at 10.00 pm which has not happened for aaaages! Oh dear! 10.00-07.00 am – Asleep for longer than usual. Didn’t wake in the night awake enough to have a little read as planned. 07.00-08.00 – Breakfast with “Fellowship of Ink!, 50 pages down and not many to go. 08.00-09.00 – Finished “Fellowship of Ink” 82 pages done. Phew! But it was good (review below). 09.00-10.00 – Picked up Debbie Macomber’s “Summertime Dreams” which is made up of two books. Read 90 pages of “A Little Bit Country” through most of the hour. 10.00-11.00 – Finished “A Little Bit Country” – 111 pages and my most pagey hour. Very easy reading but a good one (review below). 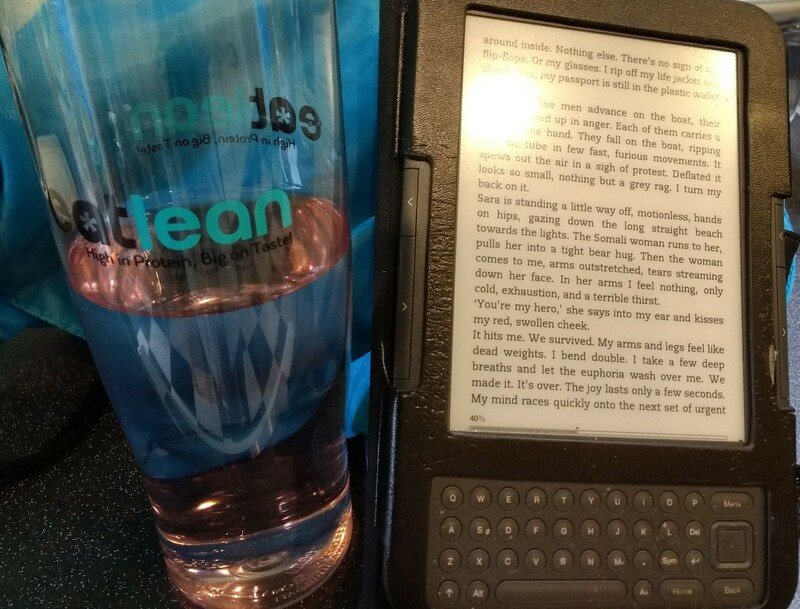 11.00-1.00 – Took my Kindle to the gym and did post-marathon non-impact cross trainer and static bike while reading “Butterfly” by Yusra Mardini. I ended up reading 65%, the equivalent of 187 pages. So in total a nice round 700 pages (I did not plan that). The experience was OK – the amount of info on the website, Goodreads group and Facebook page was a bit overwhelming but if you asked a question, someone was right on it answering kindly and patiently. I didn’t take part in hourly competitions etc as was just reading, and I know Ali tweeted a bit and got more interaction out of that. Because I can’t stay up late and because of the time zones, I felt a bit distanced, but that was my fault, not the fault of the group or organisers. A glorious romp of a book, with nasty creatures, fusty professors and heroic young men abounding. When Professor Henry Cleavis and his friend John arrive in Darkholmes, a university town in the north of England, they start encountering odd things right away. Will they be able to do their usual trick of investigating oddities or was Henry actually invited for his intellect and books? Alongside Evelyn Tyler, a downtrodden professor’s wife and, well, a certain fairly scarred lady called Brenda … they slip through holes in time and have a whale of a time. 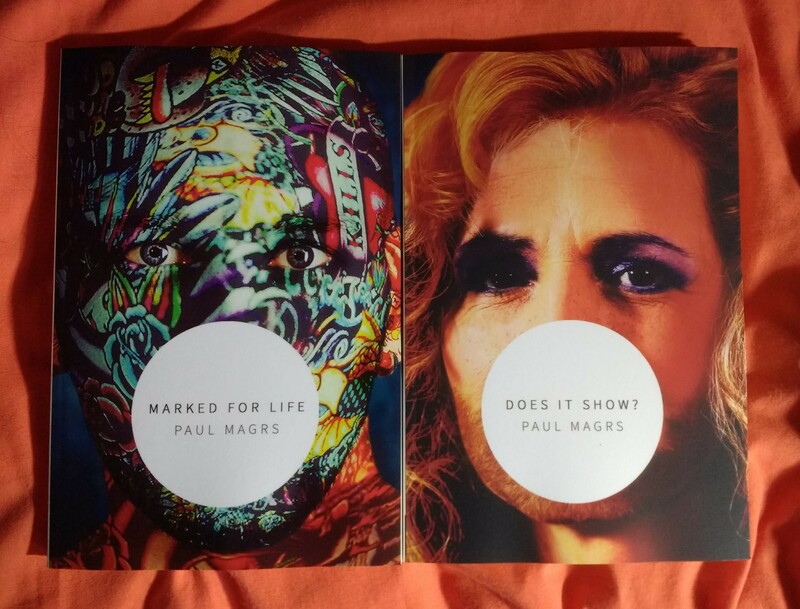 Paul Magr’s trademark style is all over the book; he has a way of writing that instantly identifies itself and I love that he’s retained that over his career. Who else would write, “He went berserk in a very fastidious fashion, wreaking havoc in a quite localized area”? I loved the tying together of imagination and reality – when John enters a particular world, he almost recognises the worlds of magical animals that he used to draw as a child. How lovely! There are loads of nods to other writers, from the worlds between worlds of Narnia and the endless winter there, and the Inklings themselves to Diana Wynne Jones’ Derkholm and Evelyn’s maiden name, Fisk. But the rest is of course highly original, funny, diverse and fascinating. The book ended a little abruptly and looked as if it was heading for a sequel. Will there be one? Rorie breaks down in the middle of Oregon and is rescued by a hunky horsebreeder and his sweet brother. Will she fall for their rural charms or head back for her city boyfriend? Well, we know the answer but it’s really nicely done as ever, with the addition of a friend/rival and a nice library background. A good read, fun and reliable. Look at me getting through the books on the shelf with another paperback taken off … and I’ve picked up that HUGE one to start, too. However, there are three confessions under this review. To be fair on me, two of them (with I think two more to come) I ordered on a pre-order thing (a bit like the old subscription model for publishing books) in September 2016, so I can hardly be castigated for clicky-clicky sins committed that long ago … can I? This was bought as a random purchase in Oxfam and I’m very pleased with it. I do love a small-town America story and so does the Swedish author, and this has the added deliciousness of being seen from an outsider’s perspective. It opens very notably with shy Sara standing on the main street of Hope, Iowa, nose in a book, waiting for a lift to an epistolatory friend’s house in Broken Wheel. But something seems to have gone wrong. Now, this is a romance to an extent, but a very quirky one, and it fulfils the criteria of two women talking about something other than a man very nicely. Because Sara’s a bookaholic and the one thing she wants to do for the residents of Broken Wheel before her visa runs out is get them reading. She sets up a bookshop, adds brilliant labels to the shelves, and waits to see what she can do. And whether it’s a pillar of the church sniffing out the gay erotica or a broken and pitied man getting a taste for chick lit, it starts to work. Andy and Carl looked at one another, amazed by how simple it was for heterosexual people to say those words. “She has to get married,” they said to each other quietly. It’s also blisteringly honest on the microscope of small-town life and the price that’s paid if you go against the norms, whether as a teenage mum or a single woman who had one embarrassing moment early on and has steered clear of men forever more. I liked how the men in the book were caring and vulnerable as much as the women, very balanced but not in a lectury way. The links and musings on books are lovely, from a random list of first lines that everyone will get something out of to mentions of books you might love, too – I was particularly pleased to see mention of Fannie Flagg’s “A Redbird Christmas” and there’s praise from Flagg on the back, too. Oh, and Iris Murdoch’s “The Sea, The Sea” is inserted into the text on the shelf of books that gives this novel its title – hooray! This isn’t all spoon-fed to the readers – some books and characters are inserted very subtly into the narrative. 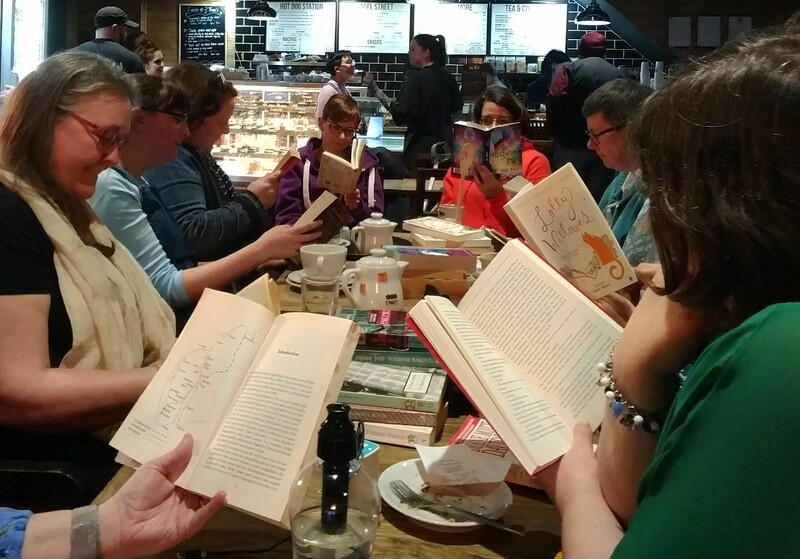 Only one shocker – and this made me laugh, after reading this post on Hard Book Habit a few days ago – when I got to the end it turned out to be a Richard & Judy book club choice! On to the CONFESSIONS. First off, I went to a new hairdresser on Tuesday, having been with my previous one for about eight years. Closer at hand and run by someone from my running club, but it’s still nerve-wracking changing hairdresser, amiright? Anyway, all went very well, I have my hair back to how I like it and it was SO QUICK getting there and back compared to the old one that I somehow fell into the Oxfam Books shop and spotted this one. 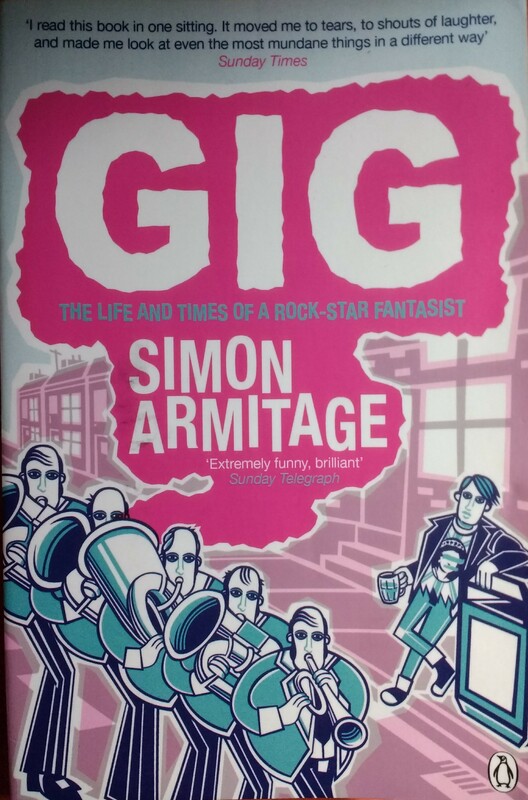 A book about music by favourite poet and travel writer Simon Armitage? Had to be done. Then just LOOK at these lovelies. Back in September 2016, I found out that Lethe Press were reprinting author and friend Paul Magrs’ earliest novels, the Phoenix Court series. Think magical realism set around North-Eastern tower blocks and precincts. I loved these and realised a while ago that I’d read them when they were new, getting them out of Lewisham Library when I lived in New Cross Gate. I have such happy memories of reading them and finding a great, new – different, very different – writer, and then a few years later got in touch with Paul after reading his book “Exchange” in 2006 (here’s my 2012 review) and have met him and count him as a friend. ANYWAY, Lethe Press were doing a pre-order thing, kind of like the subscription model that publishing used to use, and what is hopefully the first two of a series have now arrived – what fabulous covers! They have additional material, too, short stories and the like. What a treat! Finally (sorry for the long post) some challenges. Yes, I know I’m not doing challenges this year. It’s nearly time for Simon and Karen’s [year] club and this time round it’s the 1977 Club. As I’ve wanted to re-read Angela Carter’s “The Passion of New Eve” forever, I have earmarked that to read on Monday. Hooray! I’m also going to be reading as much as I can in the 24 hours from 1pm on 28 April to 1pm on 29 April as I’ve realised I’ve got space in my schedule to do Dewey’s Readathon, which I know a few bloggers I follow do. All very exciting. FAQs here and do join in if you fancy it. Oh, and actually finally, I’ve started reading Christopher Booker’s “The Seven Basic Plots” which is that basically humongous book you can see in my TBR pic at the top. It’s impossible to read apart from in bed, so I’ve also started Georgette Heyer’s “April Lady” (topical! ), having finished another NetGalley book which I’ll review over the weekend.